From Aleph to Zion and Bert to Ernie, welcome to the wonderful world of SHALOM SESAME: THE COMPLETE SET, a fun-filled, fact-filled journey to Israel and its rich cultural heritage. 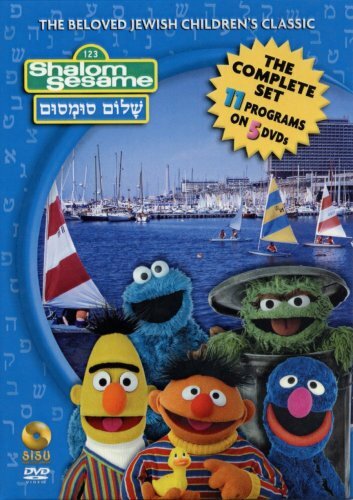 Now on DVD, the best-selling SHALOM SESAME: THE COMPLETE SET features the following 11 programs on 5 discs: The Land of Israel, Tel Aviv, Kibbutz, The People of Israel, Jerusalem, Chanukah, Sing Around the Seasons, Journey to Secret Places, Aleph-Bet Telethon, Passover, and Kids Sing Israel. It stars Itzhak Perlman, Bonnie Franklin, Jeremy Miller, Jerry Stiller and Sarah Jessica Parker, with guest appearances by Mary Tyler Moore, Mandy Patinkin, Joan Rivers, Alan King, Nell Carter, Joshua Rifkind, Tracey Gold, Paul Shaffer, Anne Meara, B.B. King and Oscar the Grouch. The best selling series ever of Jewish children's video! Sold in excess of 400,000 copies since its inception. Long awaited DVD release-Digitally Remastered Multi-show volumes. If you have any questions about this product by UNKNO, contact us by completing and submitting the form below. If you are looking for a specif part number, please include it with your message.